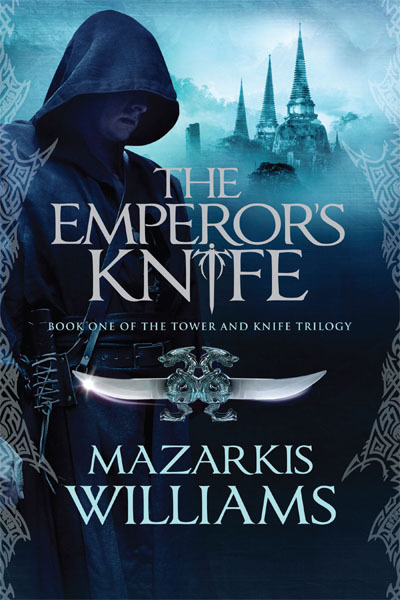 Mazarkis Williams is one of those authors that I found out about through Twitter, much as with a LOT of other authors I’ve read this year. His novel promised a lot, being of a middle-eastern bent with regards to the primary culture, and since it is about assassins, hooded assassins at that. I like assassins, thieves, and the kind in fantasy, although I think that they are becoming too much of a staple these days. Still, I was excited to be reading this novel. Sadly, my expectations were never satisfied. Reading this novel left me, honestly, cold. My reaction was a massive disappointment with what had been done. It’s significant to mention here that I broke my 60-page rule with this novel. Generally, if I’m having trouble with a novel, it has no more than 60-pages to get me over the hurdle and keep my interest. The Emperor’s Knife did not do that. I kept going on, waiting for that moment where the novel would finally start working for me. That point never came. I read the entire novel since I had kind of talked a lot about getting to it on Twitter and I felt some sort of commitment to seeing it through to the end. Thing is, the novel feels to be very much by the numbers. Prince Sarmin, a male protagonist who is a royal, but has been kept “hidden” from the outside world by his brother who rules the empire. Mesema, a female protagonist from a tribal clan who is very independent and is being sent off to marry the king’s brother (or the king himself, it is never exactly clear). Eyul, an old assassin in royal employ who murdered the male protagonist’s siblings, keeping only him and the older brother alive. The assassin happens to be getting tired of his job. There is an “evil” uncle/advisor who wants the throne for himself. The boys’ mother is also involved in the plotting. There’s a sickness going around the empire, one that threatens the stability of the empire since even the king is infected! There is so much potential here, so many interesting concepts. But it all fell flat for me. The narrative drags out interminably, making for a really tough read. The motivations for the characters are rarely clear and some of the flip-flops left me shaking my head, confused at what had just happened. The whole angst that Sarmin and Mesema feel throughout was also over-done, I had trouble taking either of them seriously, not until the final quarter of the novel at least, after which they became somewhat bearable! The disease, referred to as the Pattern, was a huge WTF for me. It’s a tattoo-ish mark that appears on the skin and then either the person dies or becomes some sort of an overcharged zombie-killing machine. And for a character who is featured on the cover, Eyul got a lot less coverage than any of the other characters. Saving grace was that he was the only character I could get behind at all. Now, if only he had much more of an agency, and a more proactive narrative role! Then there’s the whole middle-eastern influence. I know that as someone who has lived in Dubai for the last 12 years, I should be able to comment on this with some authority, but I honestly can’t. People say that the novel has a very Persian feel to it. I didn’t get any of that. The characters don’t come across as Persian/Iranian to me, although I know very little of either culture to be confident in that statement. I was expecting something Aladdin-esque in that I’m not referring to the Disney version, but to the Arabian Nights version. Do take that whole statement with a slight pinch of salt. In short, this was one of the most disappointing books I read this year, especially when measured against the expectations I had of it. Posted on December 12, 2012, in 2012 Reading Challenge, 2012 Writing Challenge, Book Reviews and tagged Advent Reviews, Arabian Fantasy, Assassins, Book Reviews, Fantasy, Jo Fletcher Books, Mazarkis Williams, The Emperor's Knife, Tower and Knife. Bookmark the permalink. 3 Comments. I had an entirely different experience and don’t recognise the excellent book I read in your review. I know you read it a while back, but come on… she’s going to marry the king? It’s called The Emperor’s Knife. It might be the emperor she’s set to marry?